Bounty Killer says Popcaan is currently the biggest dancehall artist on the planet. The Seven Star General has spoken once again, and he placed the Unruly Boss at the pinnacle of dancehall music by himself. Popcaan is undoubtedly, one of the biggest artists out of Jamaica in the last decade, but is he the leading deejay right now? Bounty Killerhas a lot of influence in the genre and has a knack for recognizing real talent since he helped bring some of the current biggest names to the forefront of reggae’s unruly cousin, dancehall. Popcaan himself is like a grandson of Killer who Vybz Kartel often refers to as his father. Bounty was the driving force behind Vybz Kartel, Mavado, Busy Signal, Elephant Man, and several more artists. 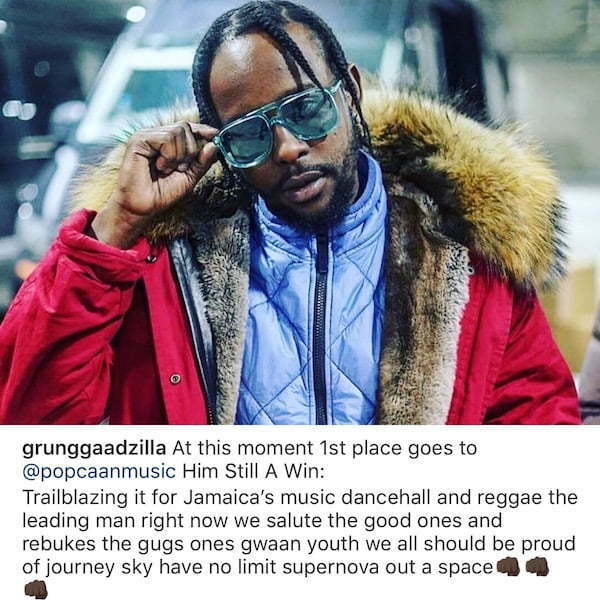 Grunggaadzilla made the bold statement on Instagram over the weekend where he made the unusual move to single out Popcaan and praised him. “At this moment 1st place goes to @popcaanmusic Him Still A Win: Trailblazing it for Jamaica’s music dancehall and reggae the leading man right now we salute the good ones and rebukes the gugs ones gwaan youth we all should be proud of ur journey sky have no limit supernova out a space,” Killer wrote. The dancehall legend added that anyone who disagrees with his statement should take some medications and fixed their brain. Despite not having a United States visa for years, Popcaan has been holding his own in a crowded local music scene with a consistent supply of hit songs. Last week, we saw Meek Mill visiting Jamaica and linking up with the Unruly Boss, and back in December, we saw Drake and Tory Lanez touching down in Jamrock and linking up with the OVO Unruly deejay, as well as, performing at the annual Unruly Fest in St. Thomas.